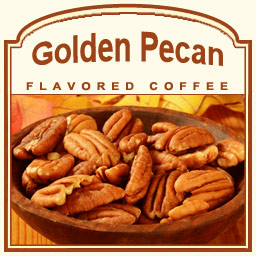 Golden Pecan Flavored Coffee is deliciously inspired from traditional Southern dishes such as pecan pie, and other desserts such as chocolate-covered pecans and freshly baked cookies. Our flavored coffee is made with 100% Arabica beans for premium taste. Enriched with a buttery pecan flavor, this coffee is something you�ll want to savor. With a lightly sweet, appetizing aroma filling the air as this coffee is brewed, it will have you wanting seconds before your first cup. 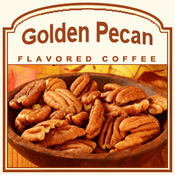 Golden Pecan flavored coffee is light-bodied with low acidity, to give you a sweet taste. To remind you of the true South, take a break and envision sitting in a rocker on the front porch, feeling the cool breezes and enjoying the sunshine.